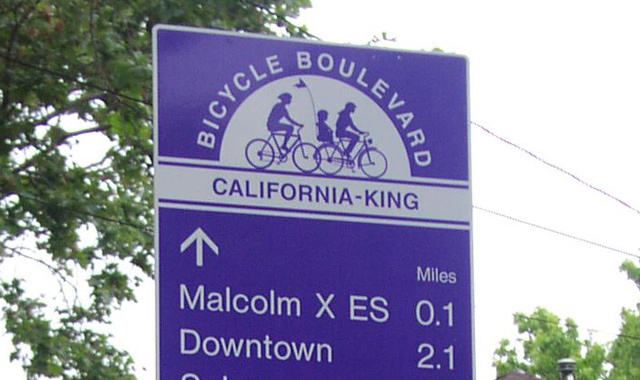 Naming a bicycle boulevard provides an opportunity to brand the route on identification signs. This sign confirms that users are on the Guilford Avenue Bicycle Boulevard and provides direction on safe street crossing. 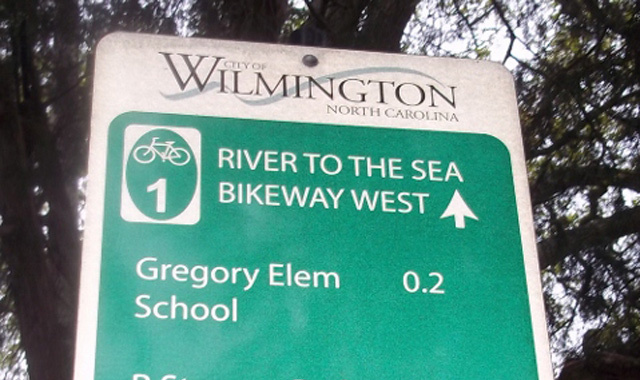 This decision sign on the Guilford Avenue Bicycle Boulevard provides users with direction to routes and destinations. A modified shared lane marking clearly shows how to follow a bicycle boulevard route. Shared lane markings identify the Going Street Neighborhood Greenway as a bicycle priority route. Wayfinding signs along the Going Street Neighborhood Greenway identify the distance to key destinations and neighborhoods and provide estimated bicycling travel times. 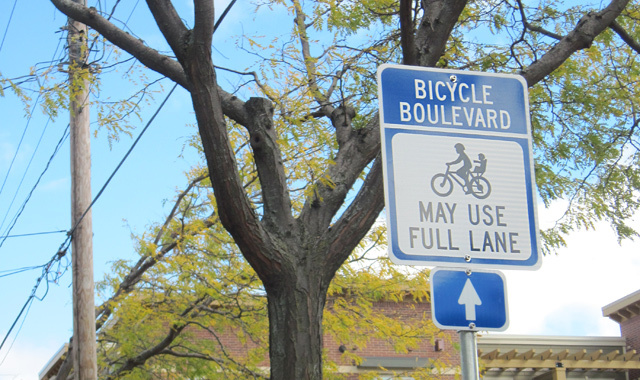 Madison uses these signs to remind users that bicyclists may occupy the full vehicle lane. 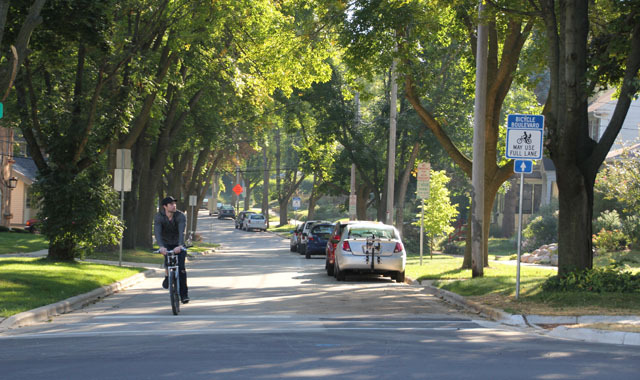 An identification sign in Madison notifies users that bicycles are encouraged to use E Wilson St. Frequent, visible placement of shared lane markings is essential. Large bicycle boulevard pavement markings alert motorists to the likely presence of bicyclists on this street in Minneapolis. 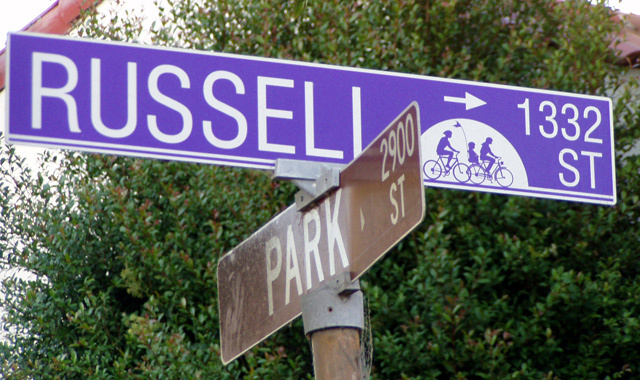 Street signs in Berkeley indicates that Russell St. is a bicycle priority route. This sign clearly communicates that people on bikes have priority. A modified shared lane marking informs riders of a change in direction along the route. 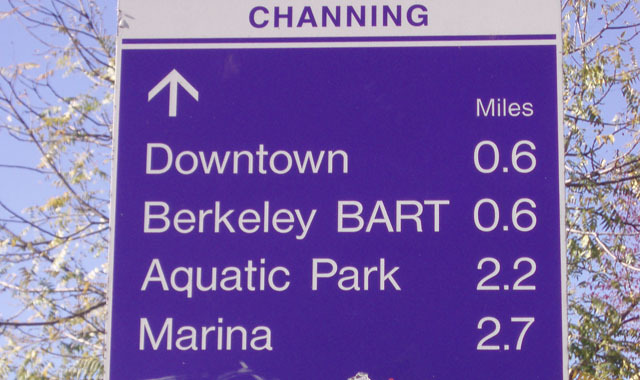 Berkeley\'s bicycle boulevard wayfinding signs provide directional guidance and distances to key destinations. Identification signs let users know they are traveling on a street intended to accommodate bicyclists. Shared Lane Marking - Berkeley, CABerkeley uses large pavement stencils with BLVD text to indicate that people on bicycles have priority. 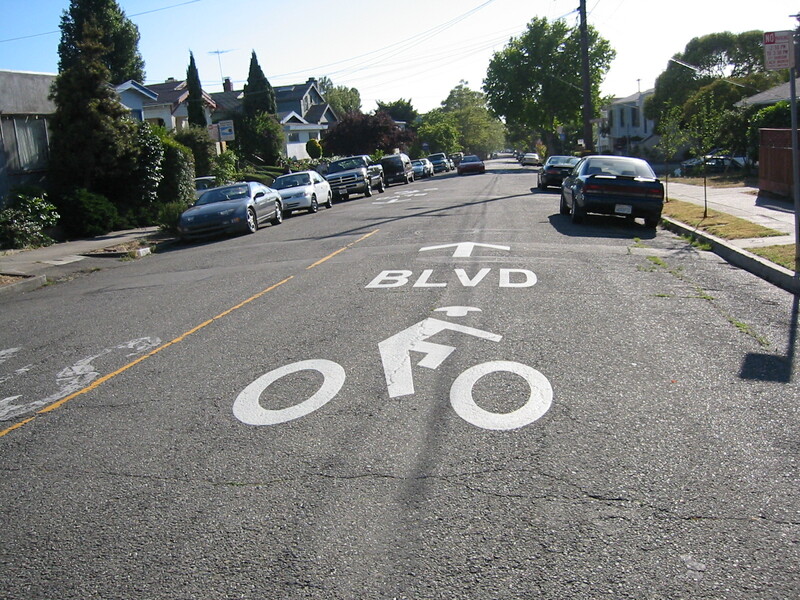 Berkeley uses large pavement stencils with BLVD text to indicate that people on bicycles have priority. Shared lane markings communicate that bicyclists may ride in the center of a lane. 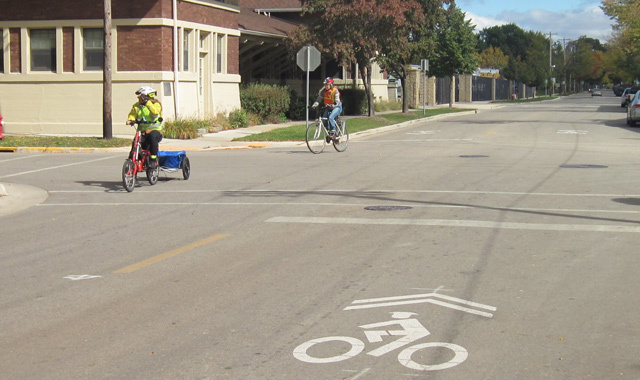 Shared lane markings provide guidance to users regarding expected bicyclist riding position. Combined identification and wayfinding signs in Nampa assist with user decision making. On the Ann Street Bicycle Boulevard the shared lane markings identify the bicycle priority of the street and direct bicyclists to ride outside of the door zone. 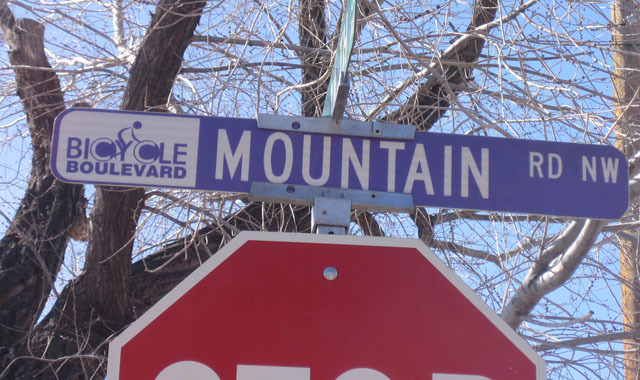 Custom colors, designs and graphics are used on the Mountain Road Bicycle Boulevard route to further identify the function of the street. A simple bicycle symbol on this street sign identifies the street as one designed for bicyclists and warns drivers to expect bicyclists crossing. 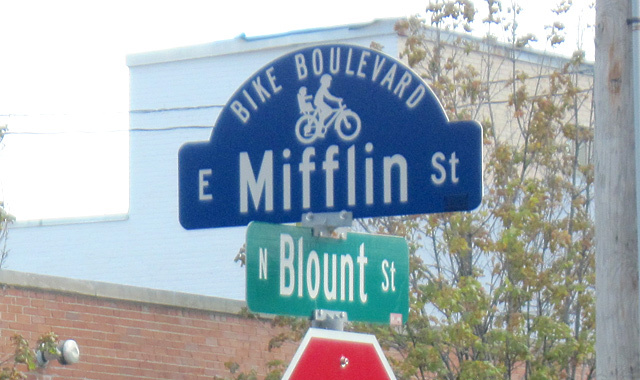 Distinctive street sign design helps differentiate the Mifflin St. Bike Boulevard from other neighborhood streets. Directional pavement markings may indicate the intersection of multiple bikeways. This decision sign provides important information to users about nearby destinations. This confirmation sign reminds users that they are on a bicycle boulevard and provides both distance and travel time to the upcoming destination. 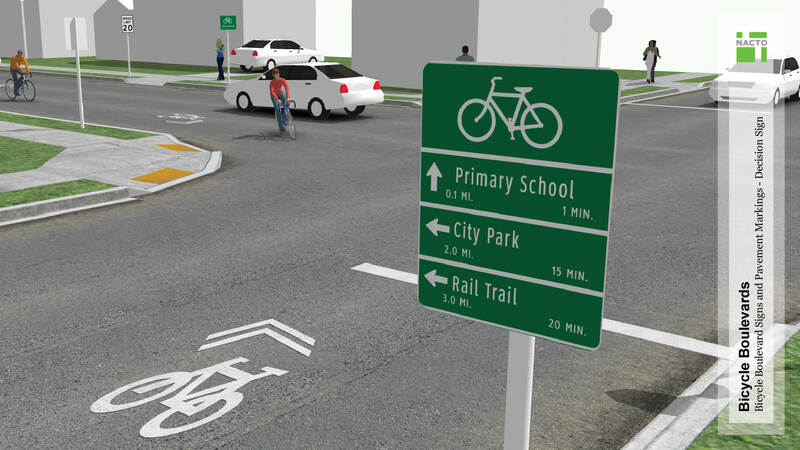 Decision signs help users navigate their way through the bikeway network. Signs and pavement markings create the basic elements of a bicycle boulevard. They indicate that a roadway is intended as a shared, slow street, and reinforce the intention of priority for bicyclists along a given route. 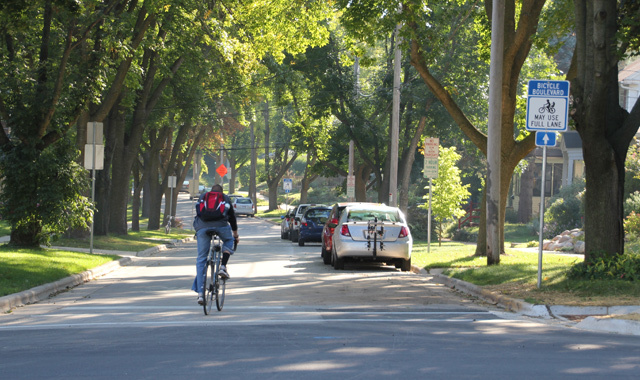 Signs and pavement markings alone do not create a safe and effective bicycle boulevard, but act as reinforcements to other traffic calming and operational changes made to the roadway. Modified street signs identify and brand the route without introducing a new sign. A bicycle symbol can be placed on a standard road sign, along with the coloration associated with the bicycle boulevard network. These are commonly used in tandem with pavement markings. 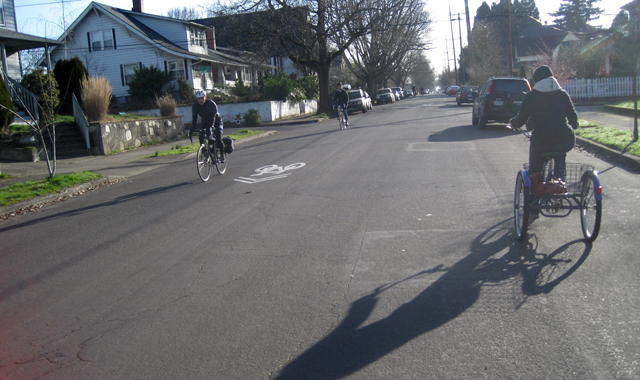 Portland, OR, Madison, WI, Nampa, ID, and Wilmington, NC, use standard shared lane markings on their neighborhood greenways/bicycle boulevards. 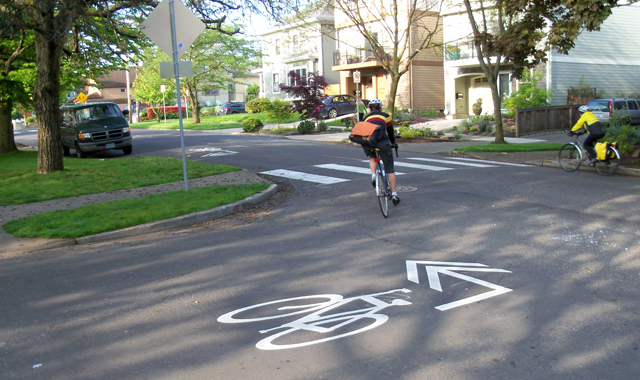 Tacoma, WA, is adjusting the standard marking to include a colored flag and modified bicyclist. 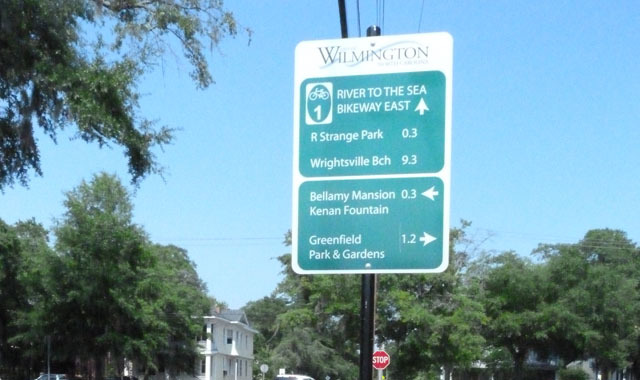 Wayfinding signs also guide users through jogs, help brand the network, and include information about the route by identifying intersecting bikeways and providing distance/time information to nearby or popular destinations. 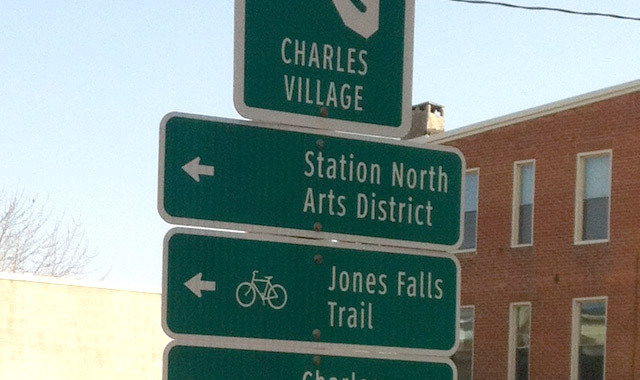 Since few businesses or services are typically located along local streets, wayfinding signs inform users of the direction and distance to key destinations, including neighborhoods, commercial districts, transit hubs, schools and universities, and connecting bikeways. 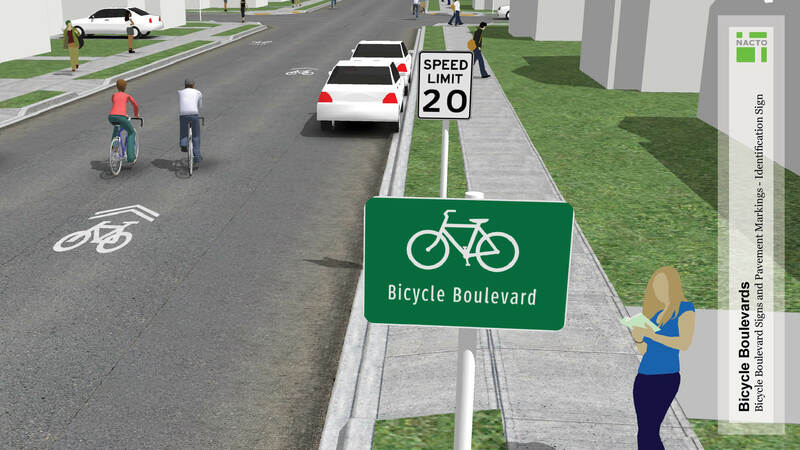 Click on the images below to view 3D concepts of basic bicycle boulevard signs and pavement markings. Signs and pavement markings help users remain on the designated route as it turns. Signs and markings differentiate bicycle boulevards from other local streets, indicating good routes for people bicycling and reminding people driving to watch for bicyclists. Signs and markings brand the bicycle boulevard to raise awareness of the designated routes and to encourage new users. Pavement markings encourage people on bicycles to properly position themselves in the roadway and reinforce to all users where bicyclists should be riding, promoting a more comfortable shared use environment for all users. Wayfinding signs provide information about nearby destinations and route finding, improving confidence for people bicycling in a new area. At intersections where the bicycle boulevard crosses another bikeway or ‘jogs’ (turns onto another street). See shared lane markings guidance for additional information on the placement and frequency of shared lane markings. 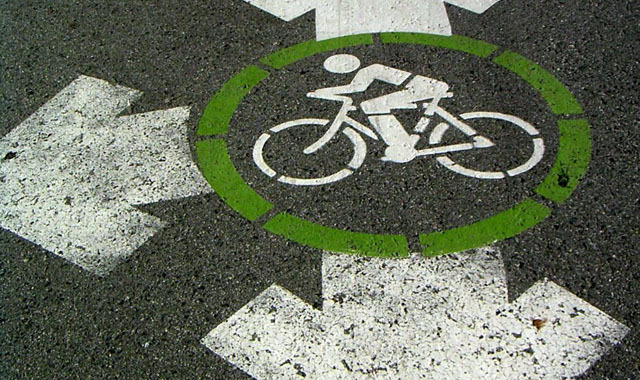 See bike route wayfinding signage and markings system for guidance on the use of directional pavement markings and wayfinding signs. 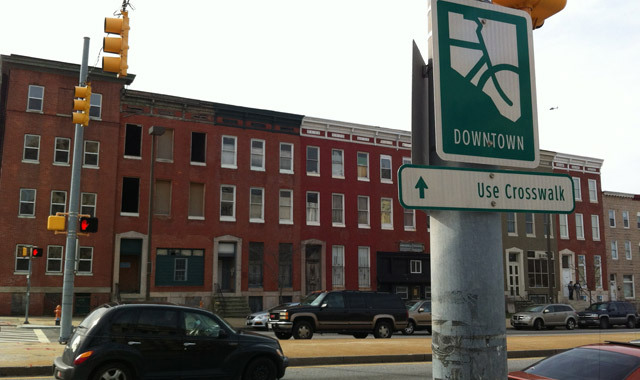 Some cities have developed unique logos or colors that help brand the wayfinding signs. The MUTCD provides guidance for use of standard shared lane markings and wayfinding signs along bicycle routes. 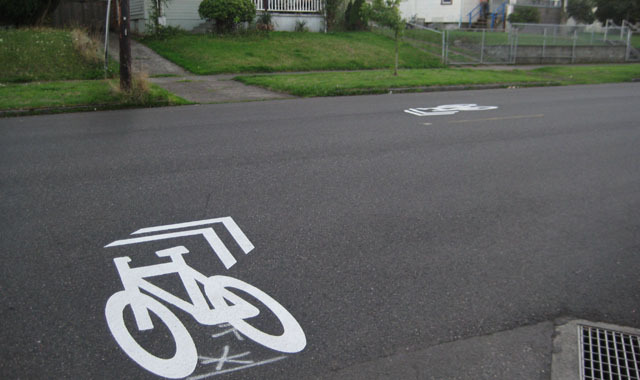 Use of pavement markings and signs specifically for bicycle boulevards is discussed below. 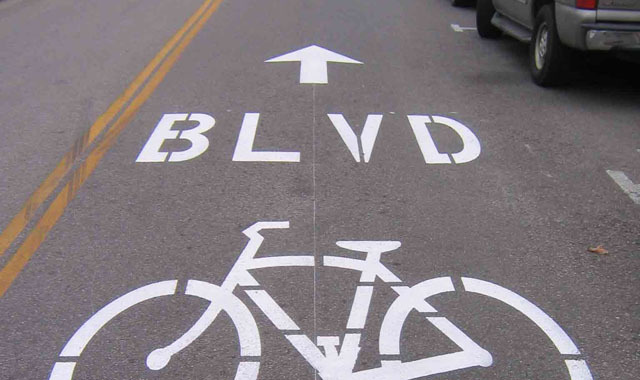 Bicycle wayfinding signage and pavement markings shall be included on bicycle boulevards. Pavement markings and identification/wayfinding signs provide a strong visual identity for the street and designate the corridor as a bicycle route. 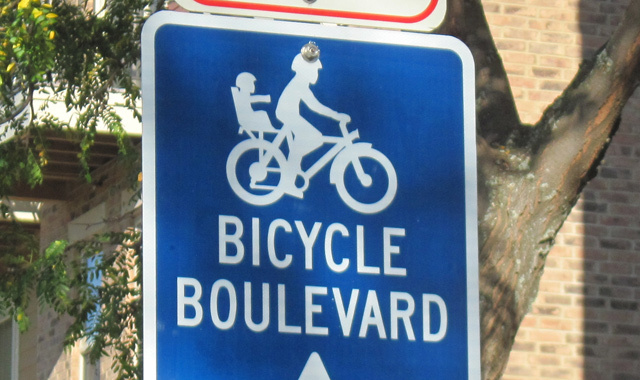 Where the bicycle boulevard turns or jogs onto another street, signs and/or markings shall be provided to indicate how users can remain on the route. Center line stripes (if present) shall be removed or not repainted, except for short sections on intersection approaches that have a stop line or traffic circle. 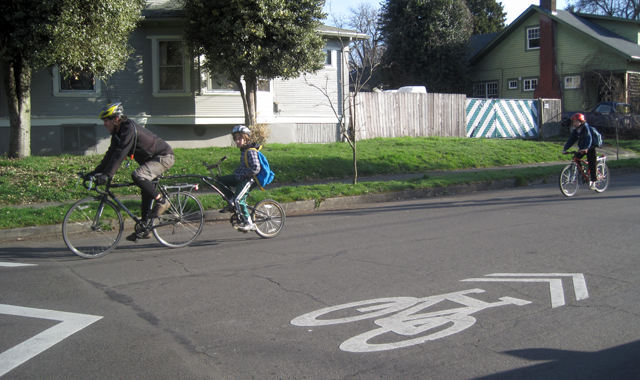 Drivers have an easier time passing bicyclists on roads that do not have centerline stripes. If vehicles cannot easily pass each other using the full width of the street, it is likely that there is too much traffic for the street to be a successful bicycle boulevard. Federal Highway Administration. (2009). Manual on Uniform Traffic Control Devices. 3B.01. Pavement markings should be large enough to be visible to all road users; 112 inches by 40 inches (the standard size of a shared lane marking) is the minimum recommended size. Decision and turn signs should include destinations with arrows and distance and/or bicycling times. Bicycling time should assume a typical speed of 10 mph. Advanced crossing warning signs such as MUTCD sign W11-1 (bicycle crossing; may be supplemented with AHEAD plaque) should be placed on intersecting streets with more than 5,000 vpd. 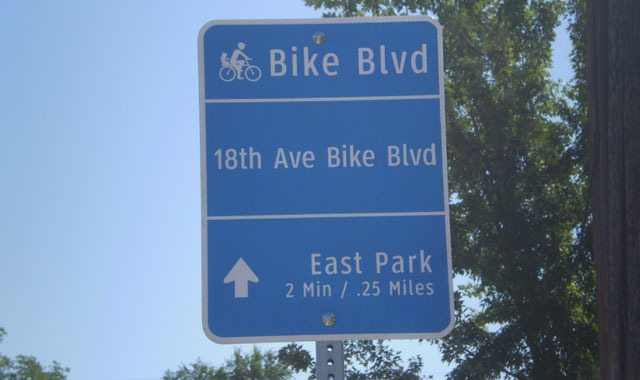 A non-standard sign using the coloration and style of other bicycle boulevard signs may be used with an arrow showing bi-directional cross traffic. On narrow local streets where it can be difficult for cars traveling in opposite directions to pass, pavement markings should be applied in closer intervals near the center of the travel lane. 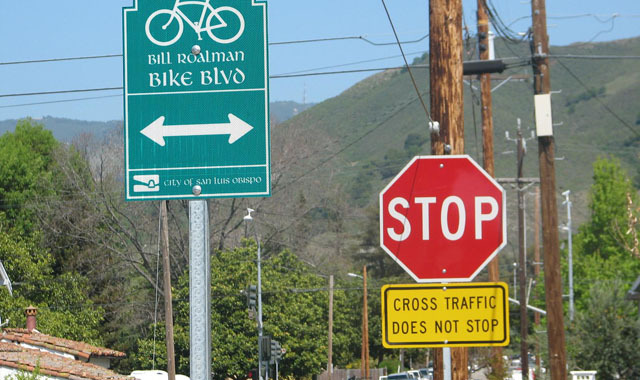 Signs may differ from those outlined in the MUTCD to highlight or brand the bicycle boulevard network. If used, signs shall be consistent in content, design, and intent; colors reserved by the MUTCD Section 1A.12 for regulatory and warning road signs (red, yellow, orange, etc.) are not recommended. Green, blue and purple are commonly used. Confirmation signs may include destinations and distance and/or bicycling times. 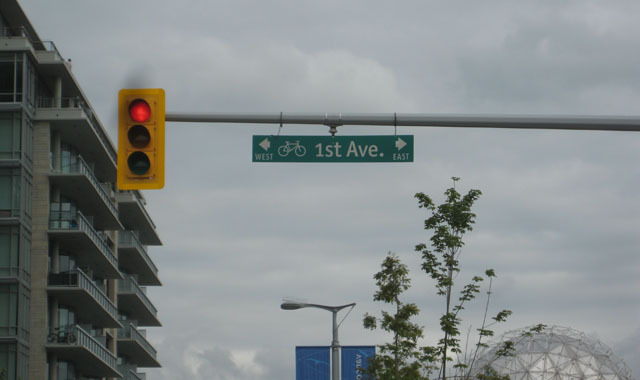 To minimize sign clutter, a bicycle symbol may be placed on a standard street name sign, along with distinctive coloration. Federal Highway Administration. (2009). Manual on Uniform Traffic Control Devices. 2D.42. 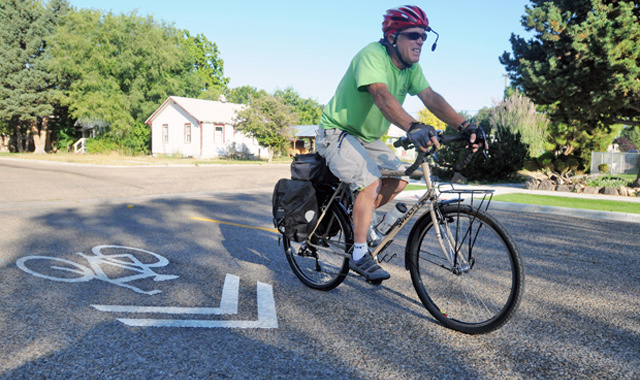 Either shared lane markings or non-standard markings may be used along bicycle boulevards. 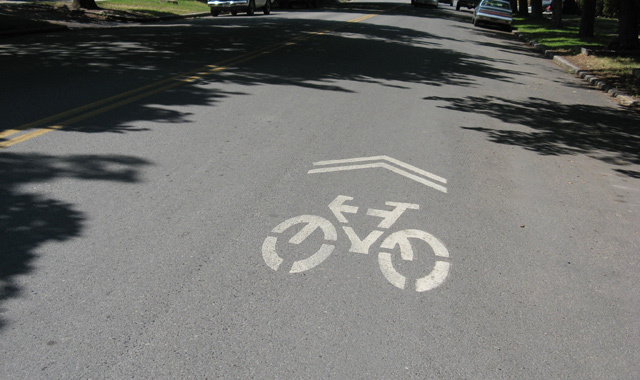 On particularly narrow streets (approximately 25 feet wide with parking), shared lane marking stencils may be placed either in the center of the lane facing each other, or with the bicycle marking in the center of the roadway and two sets of chevrons offset 1 foot in each direction or travel. For wayfinding purposes, the orientation of the chevron marking at offset intersections may be adjusted to direct bicyclists along discontinuous routes. Alternately, an arrow may be used with the chevrons to indicate the direction of the turn. Federal Highway Administration. (2009). Manual on Uniform Traffic Control Devices. 3B.19. Maintenance needs for bicycle signs are similar to other signs. Signs will need periodic replacement due to wear. The shared lane marking may be placed in the center of the lane between wheel treads to minimize wear. Shared lane markings and bicycle wayfinding signs were adopted as part of the 2009 MUTCD. The use of pavement markings to indicate turns and jogs is being tested in Columbus, MO and is used in Portland, OR. 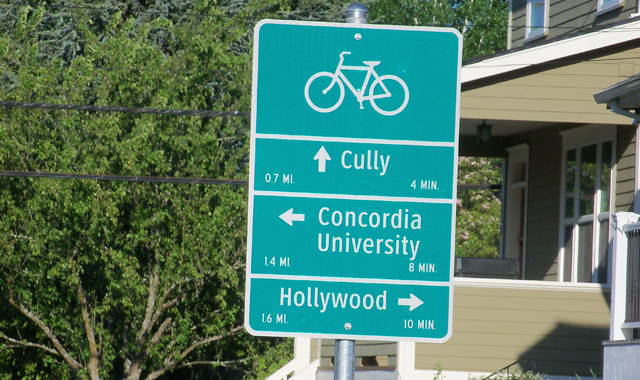 Minneapolis, MN, Berkeley, CA, and Vancouver, BC, use a modified street name sign with distinctive coloration and a bicycle symbol to indicate bicycle boulevards. 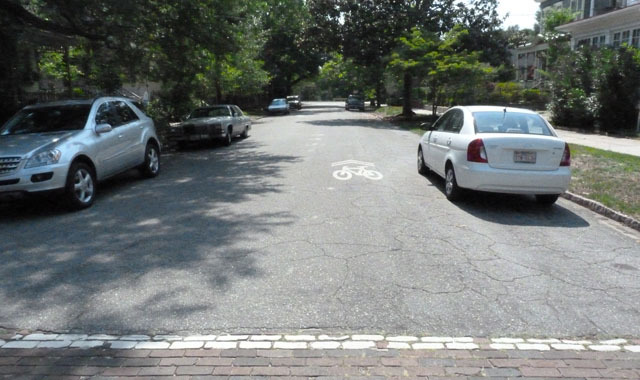 References for Bicycle Boulevard Signs and Pavement Markings: 11 found. AASHTO Task Force on Geometric Design. 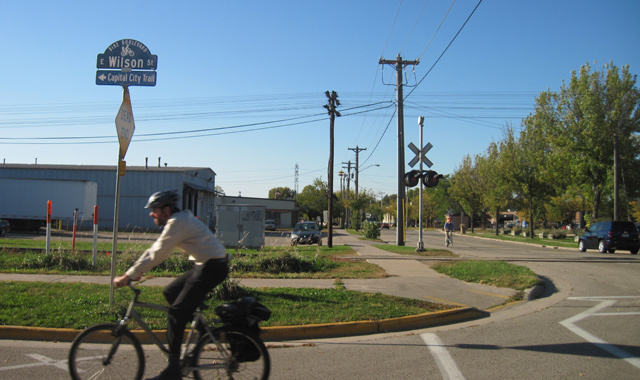 "AASHTO Guide for the Development of Bicycle Facilities." American Association of State Highway and Transportation Officials, Washington, DC. Portland Bureau of Fire, Rescue, and Emergency & Portland Office of Transportation. "Impact of Traffic Calming Devices on Emergency Vehicles." Portland Bureau of Transportation, City of Portland, Portland, OR. McElroy, Regina S. "Interim Approval for Use of Clearview Font for Positive Contrast Legends on Guide Signs." Federal Highway Administration, US Department of Transporation, Washington, DC. Alta Planning + Design. 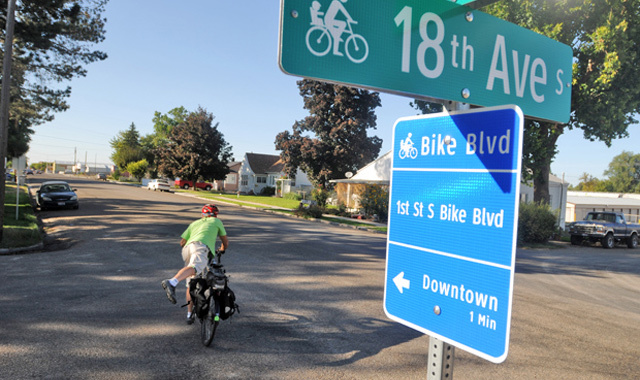 "Milwaukie Bicycle Wayfinding Signage Plan." Public Service Facility, City of Milwaukie Public Service Facility, Milwaukie, OR. 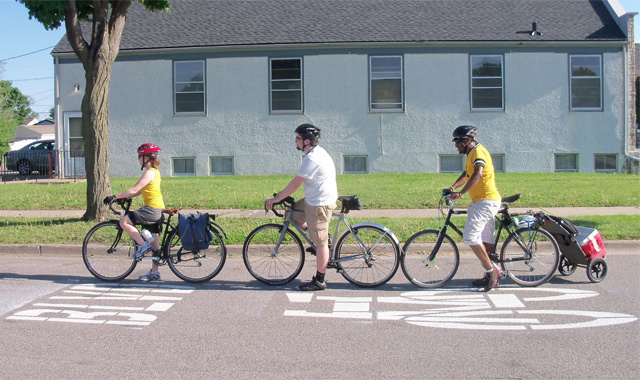 Alliant Engineering, Inc.. "Design Guidelines For Bicycle Boulevards." Department of Public Works, City of Minneapolis, Minneapolis, MN. Public Works Agency, City of Oakland. 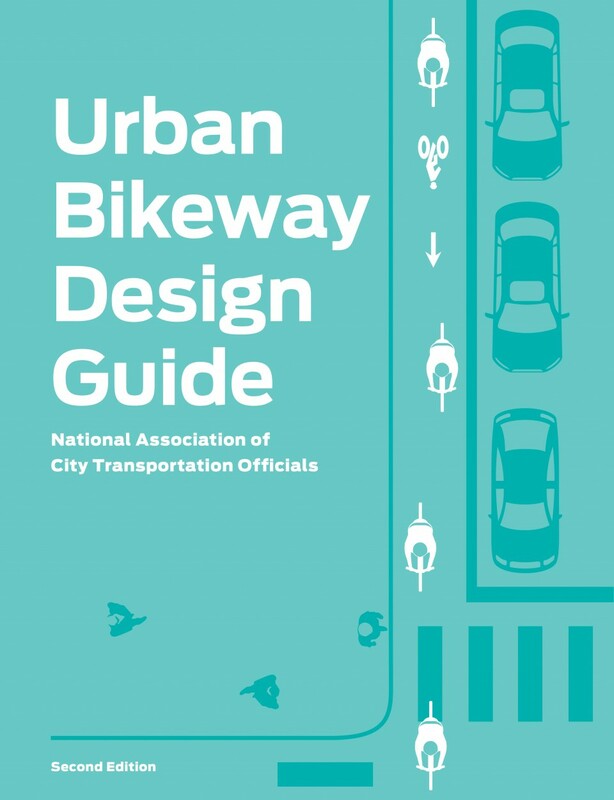 "Design Guidelines for Bicycle Wayfinding Signage." 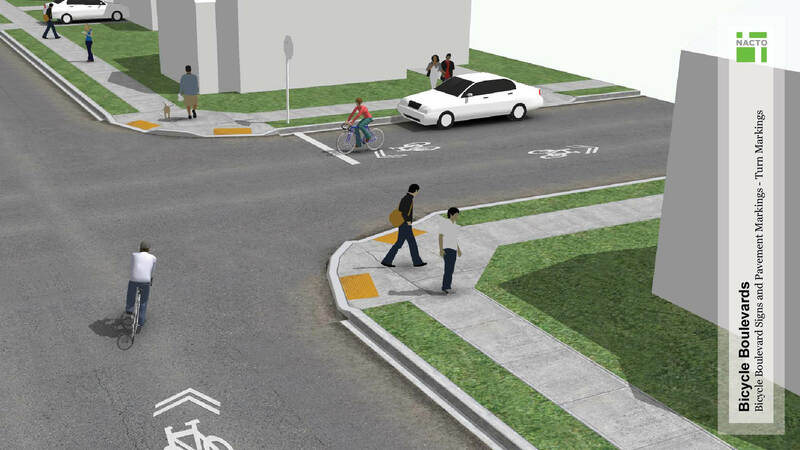 Bicycle & Pedestrian Facilities Program, City of Oakland, Oakland, CA.